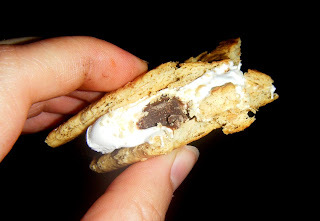 Erin's Food Files » I can’t wait to make s’more! I can’t wait to make s’more! Ok, I read food blogs every day. I remember when all the Tuesdays With Dorie people made marshmallows. I was amazed. Like really, you can make marshmallows? For real?!? 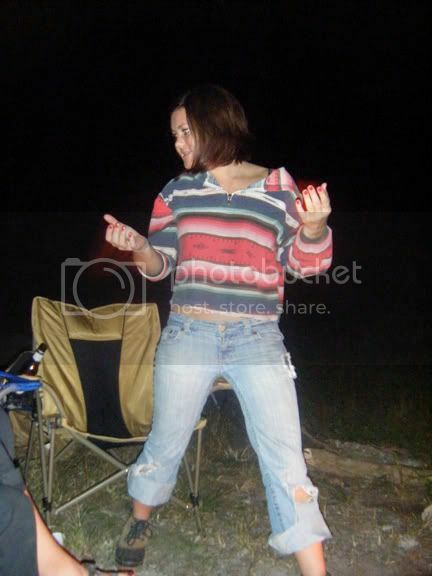 My best friends and I (from now on to be referred to as the Uptown Girls) went camping last weekend. I thought this seemed like the perfect time to try to make marshmallows! I borrowed a candy thermometer from my good friend at work, and I was ready! When I told The Boy I was planning on making marshmallows, he laughed. When I began to make them, he laughed. When I cut them the next morning he laughed. He asked why I didn’t just go out and buy them. I sometimes want to strangle him, I won’t lie. My recommendation for this recipe is… DON’T ATTEMPT WITH A CHEAPO HAND MIXER! Yikes, I seriously thought I killed it. After the 15 minutes of mixing, I turned it off when it was time to add in the vanilla, and it wouldn’t turn back on! I’d like to make these again, but with a KitchenAid stand mixer! PS. These marshmallows make AMAZING s’mores. And to quote Katie “These are better than real marshmallows!” To which I said, “Katie, these ARE real! Just homemade!” Either way she loved them, and I think she ate half of them. Seriously. Combine granulated sugar, corn syrup, salt, and 1/2 cup of water in a small heavy saucepan; place over low heat and stir until sugar has dissolved. Wash down sides of pan with a wet pastry brush to dissolve sugar crystals. Clip on candy thermometer; raise heat to high. Cook syrup without stirring until it reaches 244° (firm ball stage). Immediately remove pan from heat. Generously dust an 8x12 inch glass baking pan with confectioners' sugar. Pour marshmallow mixture into pan. Dust with confectioners' sugar; let stand over night uncovered, to dry out. The next morning, combine 2 Tbsp powdered sugar & 2 Tbsp cornstarch. Spray a pizza cutter with nonstick spray & cut marshmallows. Toss the marshmallows in the bowl to coat (this will ease the stickiness). Store in airtight container for a couple of weeks. Sounds like a blast! I’ve been looking for a good marshmellow recipe! I want to make some to put in with my hot cocoa mix for gifts at Christmas.